Conventional websites are basically designed for desktops and laptops, and they do not display well on mobile devices with smaller screens. Earlier people were forced to create separate websites for mobile devices like tabs, mobiles etc. All visitors using mobile devices to access your website were redirected to a separate website after detecting the device being used by the visitor. This was done to ensure that website is properly optimized for those specific devices without any need for unnecessary scrolling, zooming, panning etc. However, with passage of time, use of mobile devices to surf the Internet has increased manifold, and is continually on the rise. Therefore, it’s no longer feasible to design mobile websites targeting each specific device. It’s time consuming, costly, and difficult to maintain them at the same time. This also ended up with separate URLs with duplicate content, which is definitely undesirable and doesn’t go well with search engines. Also, the mobile device detection process was flawed sending visitors to wrong website version of the website. How Does a Responsive Web Design Works? 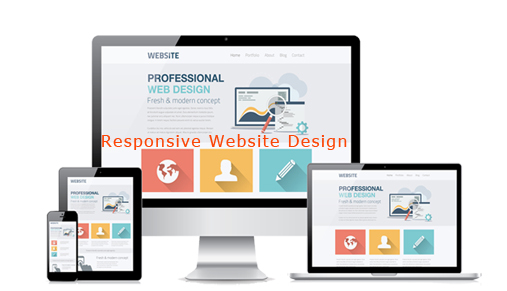 Responsive websites instantly respond the requirement of user by changing the layout of the website depending upon the device used. The layout changes according to the size and capabilities of the device. For instance, a phone can show the content in a single column view, whereas a large tablet might show it in two columns. Responsive website design changes the appearance of the website dynamically, depending upon the screen size of the mobile device being used. This technology uses breakpoints to determine the layout of the website on a particular device. Usually these breakpoints are based on the width of the browser. The same HTML coding serves all mobile devices, with the help of CSS (which decides the layout of a particular web page), for changing its appearance. Rather than creating separate sites and comparable code base for large monitors, desktops, laptops, tablets and phones, a single code base supports users of different viewports. In fact, page elements reshuffle with websites designed by responsive website Design Company as the viewport grows or shrinks. So a two-column website design for a smartphone or tablet may change to three-column design for a desktop and the same design may change to single column for a smartphone. In responsive website design, proportion based grids are used to successfully rearrange the webpage content and various design elements. Why Responsive Websites are Better? Responsive website designers use CSS3 media queries and various fluid grids for creating responsive websites, with optimal design and layout, for screens of varying sizes. So website layout will automatically change depending upon the screen size being used to view it. No separate URLs needed for similar content and hence no scope for duplicate content. Responsive web design is a must for impressive business growth as it makes users come back to a website repeatedly. As a reputed responsive website design company, we plan to expand our reach to millions of businesses globally. A responsive website design is no longer a luxury, it’s a necessity.